Both war and genocide involve death and destruction. They entail extreme violence, socio-economic devastation, and forced migration among others. Also, these unfortunate conflicts have been present in the earliest civilizations. Moreover, war may be used as a means to actualize a genocide. However, war pertains to a situation of armed antagonism while genocide is more particular at eliminating a certain tribe or race. The main difference lies on the intent of the perpetrator. The following discussions further reflect such distinctions. 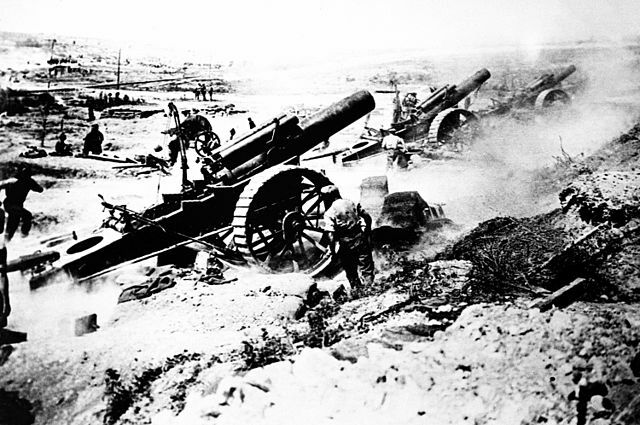 War is defined as a “state of armed conflict” between governments or groups. It has been existing in diverse cultures since the beginning of time. If misunderstandings, disagreements, or competitions cannot be facilitated through peaceful facilitations, a more violent course is more likely to ensue. The usual causes of war are disputes on territory, leadership, resources, and religion. Genocide came from the Greek word “genos” which means “clan” or “tribe” and the Latin suffix “cide” which translates to “to kill”. It is widely known as a deliberate killing of a certain race or ethnic group. The term was coined by Raphael Lemkin, a Polish-Jewish lawyer, in 1944 to refer to the holocaust. Through Lemkin’s initiative, “genocide” became a part of the International Military Tribunal charter. In 1948, the Convention on the Prevention and Punishment of the Crime of Genocide (CPPCG) was approved by the United Nations (UN). “The Great Leap Forward” of the infamous Mao Zedong resulted to millions of deaths due to starvation. Moreover, the “Cultural Revolution” which aimed to cleanse the government lead to millions of killings and harsh imprisonments. Twenty million were estimated to have perished due to Joseph Stalin’s agricultural policies, prison camps, and direct orders to exterminate the Kulaks, a social class of wealthy farmers. 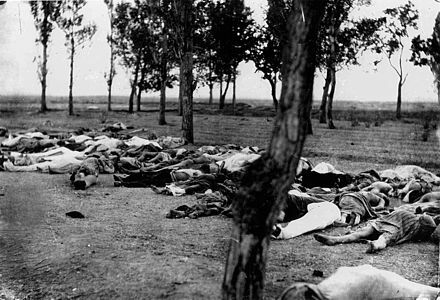 Probably the most known genocide of all time, Adolf Hitler’s holocaust led to the death of around 17 million Jews, homosexuals, Romanian gypsies, and other minority groups. The main intention of killing someone in war is to reduce the number of the opponent as a means of preserving or obtaining resources or to execute revenge. As for a genocide, the aim is to annihilate a certain group of people as it is deemed undeserving to flourish. “War” came from the Old English word “werre” or “wyrre” which means “large-scale military conflict” while “genocide” came from the Greek word “genos” which means “clan” or “tribe” and the Latin word “cide” which means “to kill”. Unlike “war” the term “genocide” was specifically coined by Raphael Lemkin in 1944 in response to the holocaust. In a war, the main target of each camp are the soldiers or armed individuals. However, the target in genocide include civilians and other helpless individuals. In fact, the majority of the victims in genocides are mere civilians. As compared to war, prejudice is more linked to genocide as it is fueled by the preconceived belief that a certain group of people is less important and not worthy of existing. As compared to war, genocide occurs less frequently as only few people have the intent to kill a certain tribe or clan. As there are different kinds of war such as civil, insurgency, and conventional, it has a higher incidence as compared to genocide. Hence, wars yield higher death tolls as compared to genocides which only target specific groups. Unlike the usual war between nations, genocide violates the laws of war since it allows deliberate killing of civilians, torture, and other kinds of inhumane treatments. There are “Laws of War” which constitute international rules and conventions which limit actions during a conflict. Fortunately, there are no “Laws of Genocide” as killing a certain group of people just because of their lineage or characteristic is a crime against humanity. Both war and genocide involve death and destruction. War pertains to a situation of armed antagonism while genocide is more particular at eliminating a certain tribe or race. The coining of the word “war” is not attributed to any particular individual while the term “genocide” was coined by Lemkin in 1944. There are “laws of war” while there are no “laws of genocide”. War does not target civilians while genocide does. As compared to war, genocide is highly associated with prejudice. Since there are more wars, they occur more frequently and have higher death tolls as compared to genocides. gene balinggan. 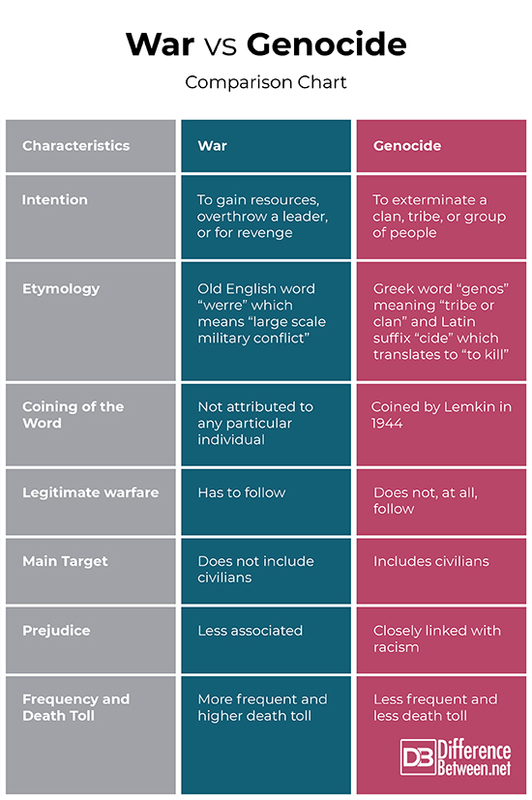 "Difference Between War and Genocide." DifferenceBetween.net. November 5, 2018 < http://www.differencebetween.net/miscellaneous/politics/difference-between-war-and-genocide/ >. Reisman, Michael and Antoniou. Chris. The laws of war. New York: Vintage, 1994. Print. Jones, Adam. Genocide. New York: Routledge, 2017. Print. Naimark, Norman. Genocide. New York: Oxford University Press, 2016. Print.